If you’re a retailer wishing to carry our line, you should call Victoria at (518) 882-1205 to inquire as to what specials we are currently offering to first time buyers, or email her directly at victoria2cmc@gmail.com. Remember, you will need to provide your Sales Tax ID Number along with your Certificate of Authority and Resale Certificate via email prior to purchase. We will help you market and brand your company’s Name and Logo on our fun interactive product line. We make it super easy to incorporate your information onto our Puff-N-Pass product with ad proofs that you help design! If you have a color theme for your store, the solid colors may be just the item for you. If the color splash works better (2 colors) we can help with that too. The best selling choice we have available is the Glow in the Dark! 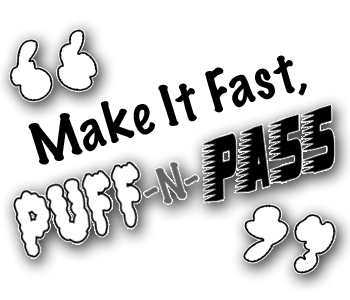 With the Glow in the Dark, the color theme can be used as the ink choice to be printed on the Puff-N-Pass. We have many options to choose from to fit your company’s needs. The minimum order (to keep costs down) is 200, but I can work with whatever amount you may need to get your brand out there to be seen and talked about. Send me, Victoria, an email at victoria2cmc@gmail.com with your logo and information to get started, or call me at (518) 882-1205. I’m excited to discuss your ideas because I know I can give you suggestions that you hadn’t considered. The possibilities are only limited to our imagination! Let’s get you noticed!